The North American teams answered some questions so you can get to know them better. 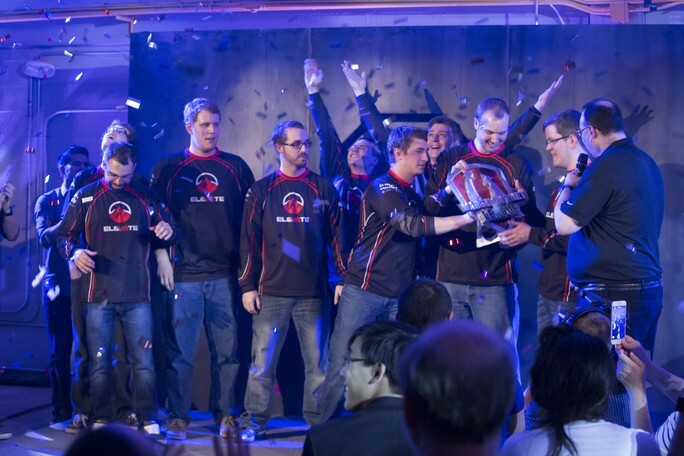 eLevate is a professional gaming organization that fields some of the top teams in the world across its many games. In World of Tanks specifically they now field two WGLNA Gold League teams with eLevate Black currently holding the title of WGLNA Champions. Outside dedication to winning, both eLevate teams strive to give an open and honest look into what it’s like to play games professionally. They achieve this through constant media production on MLG.tv and YouTube. As always none of this would be possible without the support of our fans and sponsors like Razer, Scuf, Kontrol Freek, G Fuel, G2A, Multiplay, and Esportsify. My name is Jonathan “zoidbergenstein” Pickard and in game you can find me as zoidbergenstein or just zoid if I need something shorter. I started playing World of Tanks in February of 2014 so I’ve been playing for just over a year. The 50 100 is my favourite tank but right now the T-54 lw is a close second. The 50 100 is such a dynamic tank it can do almost anything. It has enough speed that it can flank and switch sides of a map but at the same time can brawl in a city. It also punishes so hard anytime you catch a tank in the open. My role on the team since merging into eLevate Black has been more of a passive guidance and media role. I also come out and play the artillery on several maps when we need it. A lot of dedication and the understanding that this will be your life for the time you decide to do it. After 11 years of professional and competitive gaming I feel like I’ve got the routine down but I still spend 6+ hours a day making sure I’m on my game. World of Tanks is like no other game. 7v7 and a genre defying experience make it completely unique from any other game. My goal since starting World of Tanks has been to bring the NA scene to Europe and Russia. I want to show them what we are capable of. The reaction wasn’t too bad for me. I only decided to do this after playing in a world championship so I knew I could compete at that level. I still got some weird looks when people asked me what I did for a living and I would say “I play video games”. Practice Practice Practice Practice. That’s my routine. Everybody does something different but for me I can’t practice enough. Once you get to the event, practicing becomes much harder so I try to make up for the fact that I can’t practice every day at the event by practicing even harder before it. I like to try and remove the idea of luck from a tournament. To me, the teams that got where they have been got there because of skill not luck. I try to clear my mind and tell myself the better team will win, not the team with the most luck on their side. I have been involved with eLevate from the beginning. We started playing as NUC, got sponsored by Exertus, then Exertus merged with eLevate, and finally the merger with Burn All Empires happened. I have been with eLevate for just over a year and with eLevate Black since the start of Season 5. I started playing World of Tanks with the NUC guys in February of 2014. We started playing to try to get into the eSports scene and haven’t looked back since. We always had the intention of making it into the pro scene. The original eLevate roster started really strong but started to taper off as we were entering the WGLNA Silver League for Season 5. The merger with Burn All Empires though put us in a strong position for our championship run. We study hard. We watch a lot of game film, come up with strats that other teams don’t know how to deal with, and practice them to perfection. I don’t think we really have lucky rituals as a team. My most memorable moment as a team was definitely when we won Season 5. I don’t think there can be many more memorable moments than that short of going on and winning at the Global Grand Finals. We have a lot of goals but I’ll list my top 3. Continue to be a dominant force in North America, bring North American World of Tanks to the rest of the world, and help increase the fan base of the WGLNA. Hard work and smart work are what make a team successful. A team can work as hard as they want but if they aren’t working smart they won’t ever be successful. At the same time, a team can work smart but if they don’t work hard they will never reach the top. The teams that continue to win are the teams that work hard and work smart. RUlette is a Russian speaking team from the North America region. Unlike the majority of other teams going to the Grand Finals, we’re more of a casual team. We view World of Tanks as a hobby instead of a job or high priority and regardless of what happens, will be keeping this attitude. We are happy and excited to be going to Poland for the Grand Finals. We don't really have any pressure or expectations as almost everyone views us as a huge underdog. Nevertheless, just as any team, we want to succeed and prove that we belong on the world stage along with every other team at the finals. Steppes. In general, I like open maps with lots of room to manoeuvre and many viable ways of approaching the map. I'm more of the manager that has to deal with all the different personalities and egos while keeping the team on track as a whole. Mostly sacrificing your time and keeping a dedication to do something day after day, pretty much like a job. World of Tanks is a hobby at most so having fun, maybe making some money and getting free trips is always fun. I don't view myself as an eSports pro. Tanks is a hobby and it will remain simply that. The moment we as a team say screw it and stop practicing, we perform better. Got tired of random matches and decided to play tournaments, eventually I made a team when 7/42 first came to NA. Been with the core guys together for about a year. To me, it wasn't anything special just having to come to the realisation that I need to invest more time. We like to relax and go into a match without any pressure. Studying some film and having a small walkthrough. Planning our tactics helps. When we stop caring and yell screw this, we usually tend to do better. Raging out during a match in Season 4 WGLNA. Stopping all practices and then winning every match that matters all the way to winning the final. Our main goal is for Season 6. We couldn't get our true roster to come to Poland. We ended up having to bring subs. We are here simply for the experience. If we do well, that's great, but if we don't, we have no pressure. Cohesion, dedication, and a desire to get better. Keep an eye out for more interviews!